Making sure the customer didn’t use it before. Calling over the manager to verify the customer had the coupon. Digital coupons to the rescue. Customer shows the coupon on their smartphone. And in 2 seconds the coupon is redeemed and the phone never left your customers hands. Here’s what happens in the two second redemption. And to make sure the customer had the coupon your staff records the last three digits of the “Code” on the redemption screen. No need to call over the manager to look at the customer’s smartphone screen. Your manager can verify the code later when it’s much slower. Here’s the built-in checks with digital coupons. If the green button doesn’t work it’s a fake. If the coupon is expired the customer gets a message saying it is. If the coupon is used before the customer sees a message telling them the date and time they previously used it. 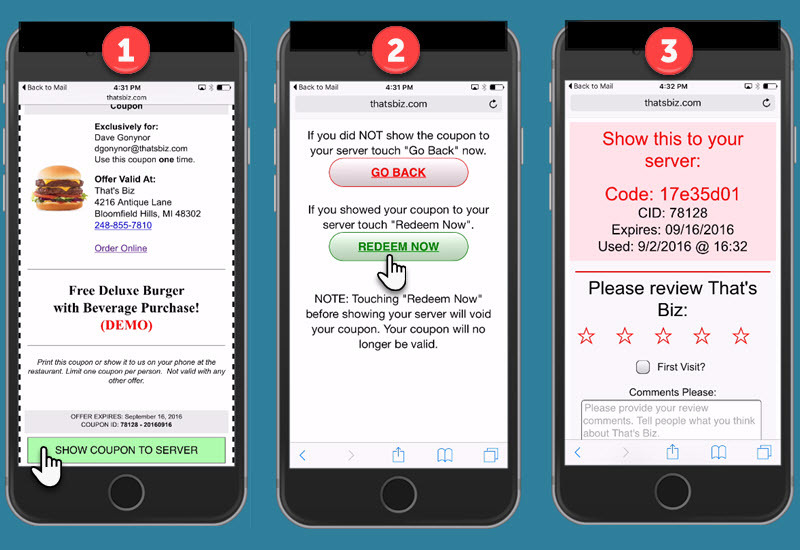 Watch this 4 minute video and see how the digital coupon verification works. It’s no surprise that digital coupons can do all of that. What’s even more surprising is you can email digital coupons from your current email marketing service. If your email marketing service is not on the list don’t worry. We can virtually guarantee it will work. We’ll be happy to test it for you as well. Adding digital coupons to your email marketing messages is like cutting warm butter with a hot knife. We create the coupon for you. We give you the URL for the coupon link. You point to the coupon link in your email message. No fussing learning a new system. Digital coupons open up a whole new world of customer convenience, target marketing, and data tracking. Never forgetting a coupon at home. Sharing great deals with friends. Saving deals for later retrieval. Online ordering links on the coupon. Online ordering links location specific. Varying coupon offers by type of location or region. Facebook Ad Pixel to build custom audiences. Coupon clicks and redemption by person. Digital coupons make your customers happy while building a treasure trove of customer tracking data to add to your analytics platforms. Improve your digital marketing with digital coupons. Interested in adding digital coupons to your email marketing service? Complete the brief interest form and we’ll give you a price estimate. Just complete the brief information form and we’ll reply in one business day. Arm your marketing team with digital coupons. And give them the information they need to make better digital marketing decisions.